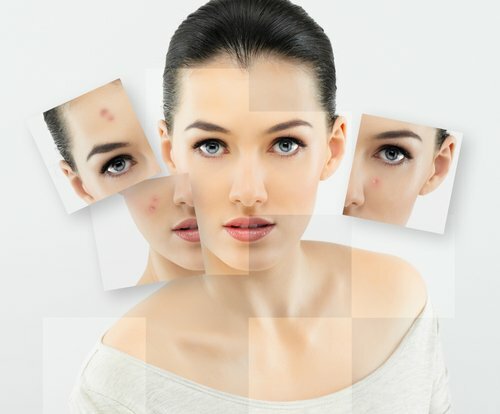 Mostly the individuals aged between 12 and 25 suffer from acne, but sometimes older and younger people are affected too. Small sebaceous glands lying right beneath your skin surface produce sebum ( an oil) which maintains your skin supple and smooth. Minute pores on your skin let the oil to come up on the surface of your skin. At times some of these pores get clogged, giving birth to pimples, blackheads and whiteheads. Benzoyl peroxide can be used for treating acne. It acts in three ways – exterminates bacteria (germs), alleviates inflammation and assists in opening blocked pores. Benzoyl peroxide is a medicine (anti-bacterial agent), which you can use to treat acne. It comes in different strengths in lotions, creams, gels, soaps, and liquids. The FDA allows benzoyl peroxide products to be sold by prescription or over-the-counter, in amounts up to 10%. (ii) Penetrates into the skin pores where it helps prevent bacteria from growing that otherwise can cause acne-pimples and cystic lesions. (iii) Has a gentle drying and peeling effect which is believed to help avert breakouts. (iv) Also helps to reduce inflammation. Caution: In the first few weeks, acne may get worse. Your skin may also become red and peel. It’s not a quick fix. You may have to use the product for as long as 4 to 6 weeks before your acne begins subsiding. Like any other medicine, a Benzoyl Peroxide product too has some side effects, although not everyone experiences them. You will find a complete list in the manufacturer’s information leaflet provided with your medicine. The side effects generally recuperate as your body adapts to the new medicine, but talk to your doctor if the side effects persists or get problematic. (i) Redness and skin peeling: This may occur when one begins treatment, but generally goes away in a day or so. Until your skin improves, cut down the number of times you use the product or the duration of time for which you leave the application on your skin. (ii) Dry skin, itching, tingling, slight stinging or burning: If it troubles you much, cut down the frequency for which you use the application, or pause using it altogether for a few days. When your skin recuperates, begin using it again, but less frequently. If you suffer any other troublesome symptoms, which you think is because of the application, talk to your doctor for further advice. How To Use Benzoyl Peroxide For Acne? (i) Before starting the treatment, you should carefully read the manufacturer’s printed directions-leaflet from inside the pack. It will provide you more instructions about benzoyl peroxide along with a complete list of the side-effects that one may experience from using it. (ii) It is suggested that you use benzoyl peroxide once or twice each day. When you first start using it, use a 2.5% or 4% strength preparation. This will help you keep any skin irritation to a minimum. Lower strength preparations usually work as effective as the higher strength preparations and cause less skin irritation. If needed, you can enhance the strength as you go on, but do this gradually. (iii) You need to apply benzoyl peroxide to all of the area where your spots crop up and not only to each spot. (iv) Creams and gels should be applied for about 15 minutes or so after washing the area with mild soap and water and gently pat-drying with a soft towel. Initially you may like to wash the preparation off after a few hours, but aim to increase gradually the length of time you keep it on the skin. When your skin gets used to it, try to put it on twice a day and keep it on. (v) If you are using a ‘wash’, wet your skin first and then decant some of the liquid wash on to your hands and use it to wash the affected areas. Keep it on for a minute or so, and then rinse it off. Pat-dry the area gently with a soft towel. (vi) While you apply benzoyl peroxide, make sure not to allow getting it on to sensitive areas of the skin, in or around nostrils, eyes and mouth. Also avoid any areas of skin that are irritated or sore. How To Get The Most From Benzoyl Peroxide Acne Treatment? (i) It is suggested that you use a gentle soap and lukewarm water to wash with. You cannot clear off blackheads. The black tip of a blackhead is in fact a skin pigment and cannot be eliminated by wiping or scrubbing. (ii) If you feel your skin is getting too much dry, it may help to use a fragrance-free and water-based moisturizing cream. Stay away from using ointments or oil-rich creams, because these could block the pores again. (iii) Benzoyl peroxide has bleaching effect, be sure to not get it on to your hair or clothing. (iv) Benzoyl peroxide can make some people’s skin to get more sensitive to sunlight than normal, so avoid going into intense sunlight, or apply a sun cream with a high sun protection component if you are not sure how your skin reacts. Moreover, avoid using sunbeds. (v) Carry on the treatment for at least six weeks before deciding if it is working for you or not. The most common cause for it being unsuccessful is giving it up too soon, thinking that the treatment is not working. However, if your acne condition does not improve after two months then you need to talk to a dermatologist for further advice. (vi) Once your acne spots have disappeared, acne often breakouts again if you end the treatment completely – thus it is recommended to continue with a maintenance treatment. You may observe that one application every alternate day with a low-strength preparation is enough for this. Where Can I Buy Benzoyl Peroxide? Many people ask – where to buy benzoyl peroxide? You can choose and buy products that contain benzoyl peroxide without a prescription here. It is available in different brand names and strengths (2.5%, 4%, 5% and 10% strength). Benzoyl peroxide also comes in combination preparations for acne. It can be combined with an antibiotic such as clindamycin once Daily), or with another medicine used for acne, such as adapalene, but both of these preparations need to be prescribed by a doctor, and should be used as directed by the doctor. Acne Tip: Start with the lowest strength to see how your skin reacts. 2.5% benzoyl peroxide is just as effective as higher concentrations with fewer side effects. (i) Check with a doctor before allowing a child younger than 12 to use a product that has benzoyl peroxide. (ii) Store benzoyl peroxide products a cool, dry place, away from direct heat and light.